Why do you think the way you do? This question, while so simple on the surface, will reveal a fundamental truth we must all face. We think the way we do today because we were taught too… we were brainwashed. From the moment of our births, we have been indoctrinated into a system that serves few while subjugating the many. This is not an intentional effort by our parents or loved ones, instead, it is an accepted facet of life few even realize is taking place. From our education system to our entertainment, all aspects of our existence are carefully designed to take control from us – control we can take back with proper training! 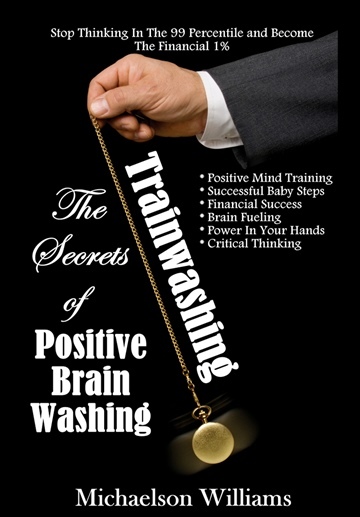 Trainwashing is the mental cleansing program that will break you free of the status quo, reset your brain and help you achieve the success you truly deserve. When you realize, or remember, that you can honestly do anything… then anything is possible. Removing the negative mantras that have brainwashed you into thinking things are ‘meant to be this way’ or have kept you in a cycle of ‘busy work’, is the first step into becoming who you are meant to be – who you were always meant to be before the world told you differently. Starting today, you can rewind and retrain your brain. With Trainwashing you can discover who you really are, leave behind the ranks of the mundane and join the circle of the 1% elites. Michaelson Williams, an entrepreneur, author, and critical thinker, applies a unique philosophy and psychology when thinking about success. Having been the CEO of multiple companies, involved in martial arts since the age of 4 ½ years old, a health and fitness consultant, and an avid student of years of psychology study, he developed a unique technique called “Trainwashing”. He hopes his new Trainwashing techniques will assist others in becoming successful.